American Roulette is the second most popular Roulette Type. It’s mostly played in the USA and is offered in live, land-based casinos. It differs from any other Roulette by featuring a Double Zero Roulette Wheel. There’s a 0 and 00 on the wheel and Roulette Layout. American version of this game features some bets that can only be made in this type. While American Roulette has kept becoming more and more popular, it’s actually one of the worst Roulette types to play. This is due to the double-zero wheel, which decreases the winning odds while keeping same pay-out ones. American Roulette features a house edge of approximately 5.24%. This means that you’ll loose an average of $5,24 for every $100 wagered at the tables. This doesn’t keep many players from playing and winning at American version of this game, though. Even if the odds are not in your favour, you can still try out some Roulette Strategies and betting systems. I’d advise you to learn about Martingale and d’Alembert strategies as these two seem to be the most popular ones across American Roulette players. While the name of this Roulette Type might lead one into thinking that it’s a game for Americans, this couldn’t be farther from the truth. 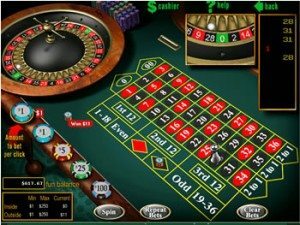 Every single Online Casino that offers any kind of Roulette Tables will certainly have American Roulette as a part of their offerings. Why wouldn’t they? It features larger house edge than its ”relatives”. Find the Best American Roulette Casinos below.